Sticky rice - in scoops of course! Peel the garlic. Mince in a food processor or by hand with a sharp knife. Set aside in a bowl. In a large sauté pan heat 4 tablespoons of the butter and add the pineapple and 2-3 tablespoons of of the chili pepper water, sauté for about 5 minutes until starting to soften, remove from pan. Add 4 more tablespoons of butter, 2-3 more tablespoons of the chili pepper water and add in shrimp in a single layer. ( You may have to make the shrimp in 2-3 batches depending on size of pan used). Cook shrimp for 1-2 minutes then flip. Add in half the garlic (or all if making in one batch), lemon juice, pineapple (only half if doing two batches of shrimp) and another tablespoon of the chili water. Cook another 2-3 min or until opaque. 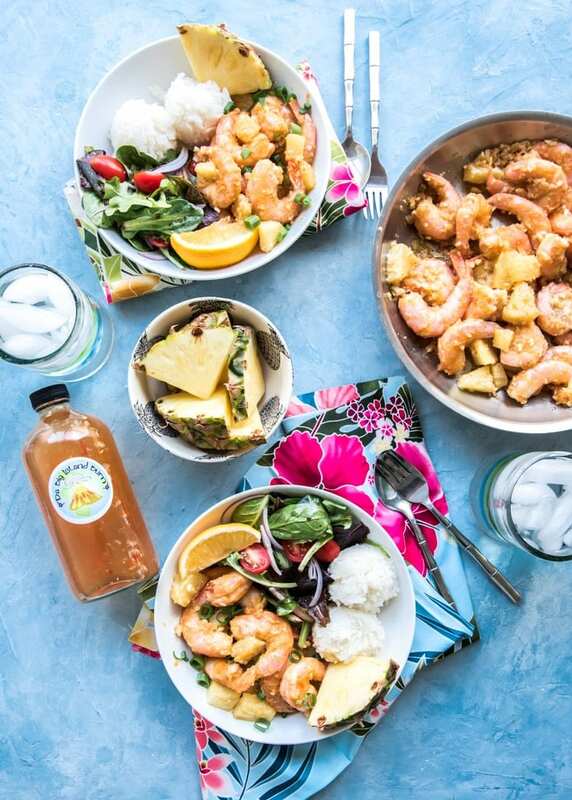 Remove the shrimp and pineapple. If making the shrimp in 2-3 batches repeat with butter, chili pepper water, lemon juice, pineapple and garlic, dividing it all into 2-3 portions each. The more chili pepper water you add the spicier it will be. Once all the shrimp is finished add in 2 more tablespoons butter to the pan and the rest of the chili pepper water, cook until butter is foamy and scrape up the garlic bits left in the pan. 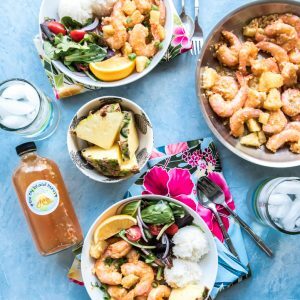 Serve the shrimp with scoops of sticky rice, pour the remaining pan sauce over the shrimp and add a side of green salad, pineapple wedges, a lemon wedge and more chili water if even hotter shrimp is desired. This recipe will most likely be made in several batches depending on how many shrimp used, size of shrimp and size of pan. Make sure you remove all the garlic between batches so none burns. The garlic is added in when the shrimp is flipped so it cooks but doesn’t burn. You can make this recipe with the shells off, but it will cook a lot faster not giving the garlic a chance to cook. I you make without shells add the garlic with the butter before adding the shrimp. Stir as you cook so the garlic doesn’t burn and the shrimp doesn’t over cook. The recipe is better with the shells. This is a messy eat with your hands recipe so get lots of napkins, dig in and enjoy!